Cafes, restaurants, harbour strolls on your doorstep. This is a full sized, fully furnished 240sqm home, however it is only lived in part-time, as the owners travel a great deal. It’s ready to be yours from the minute you move in, with a fully stocked kitchen (crockery, cutlery, utensils), thick, soft hotel grade towels, crisp bed linen, and free wireless internet. Downstairs you'll find two bedrooms - one large with two twin beds, the other more compact, containing a Queen. Also downstairs is a shower and bath. The middle level contains the kitchen, a large living space, and a deck that runs the length of the house with seating for 10. This is the best spot for both breakfast in the morning and late afternoon or evening drinks. Right at the top is a large private living space, deck, master bedroom and bathroom with shower. The house is not suitable for more than 2 couples. We're a family of 4 who live to travel and love to travel well. We spend so much time in apartments, hotels (and yes, VRBO properties) that we know what it is like to land in a new place and turn it into 'home' for as long as it needs to be. We hope you'll enjoy our sometimes-home as much as we do, and that we are able to provide an environment as comfortable for you as it is for us. 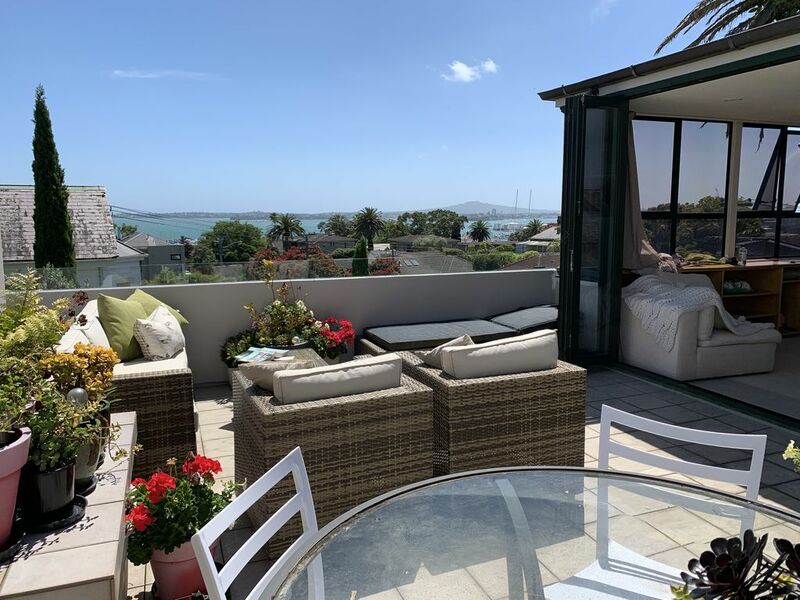 Live the City of Sails Life in this beautifully furnished, 3 storey architecturally designed house just a few minutes walk to Ponsonby Road one one side, the the water on the other. It’s the perfect spot to get away from it all or be part of the city action, with a world of fun on your doorstep, and two spacious decks just waiting to welcome you home. At the very top, watch the sun set as the bridge and city light up as you kick back with a chilled wine or beer in your own private outdoor retreat. Or throw all the doors open and curl up with a good book on the deep, comfy outdoor sofas on the long middle deck. Whatever the mood, there’s a spot in the sun for you here. Come nightfall, take your pick from renowned Ponsonby cafes and bars. Or take a five minute cab ride or 20 minute easy stroll down the hill to the city centre, jam packed with some of the best eating and night spots the Southern Hemisphere has to offer. Beautiful views out over the harbour and bridge from upper levels. Watch the yachts out on the ocean on a sunny day - the City of Sails at its best. Antique mahogany dining table - care must be taken. TV upstairs in master bedroom and in main living area: digital channels only (Netflix, Lightbox, Neon) you'll need your own iTunes login. Two very expansive decks, upstairs one with city and harbour views. There are quite a few stairs, so not suitable for people who don't do well with them. Stairs and decks not safe for young children. This is our second visit to Susi’s house in Ponsonby and again we were delighted with our stay over Christmas and New Year. It is so easy to get to all points within the CBD and beyond that this makes city shopping and further excursions very accessible. The views from all of the North and East facing windows are terrific and far reaching whilst the views and ambiance from the deck on the top master bedroom house are fantastic. A glass of wine, a good book and the views are highly recommended. The accommodation is ideal for us and our often visiting grand children. The kids bedrooms are on the ground floor level and we are two floors above in relative peace. Susi is an excellent host who is contactable at just about ant time. She has a great attitude and will do everything she can to make the renters stay as easy and comfortable as possible. House is located in a very nice area, accessible to great restaurants on Ponsonby Rd and the CBD. We loved going to the German Bakery for coffee and breakfast. Great views of the bay on 2nd and 3rd floors. Enjoyed sitting outside in the warmth of the sun. The master bedroom is very nice with views. Other 2 bedrooms are on bottom floor. Took off a star because queen bed did not have sheets and there were limited towels, wash cloths and hand towels. Also, cleaning items (vacuum, mop, cleaning cloths) were left out. Overall we were pleased with the accommodations awaiting the departure of our cruise. Thank you so much for the review of the house, and I'm so happy you enjoyed the area. I'm at a loss to understand how the Queen bed lost its sheets - I personally made up all the beds that morning, however I did break a toe just before you arrived and may have meant to go back to that one but got distracted. I'm so sorry that was the case. There were loads of towels in the downstairs cupboard in the hallway, I made sure I left a decent pile and counted them to make sure there were enough - I wish you had called me and I could have directed you right to them. The two Dyson stick vacuum cleaners, one for upstairs and one for down, were left plugged in upstairs by the kitchen where I usually leave them. I was the last person to use them, and I was using them for last minute tidying up to the minute you arrived. I did have to hunt for them when I got home and found them in a downstairs cupboard when I returned, so I wonder if one of your party tucked them away? There was a mop in the upstairs shower and the cleaning cloth up there was still sitting on the vanity where I left it. Again, I am so sorry you didn't get in touch, I'm always more than happy to take calls and could have directed you to those things. I will make sure the locations are added to the guest information that goes to the app for the future - it can be hard to find things in other peoples' houses. I'm pleased you enjoyed the stay, and I hope your cruise went well. We came for a family wedding and found the Ponsonby location on VRBO to be central and conveniently located and we were not disappointed. Great views of the city and Harbour Bridge and walking distance to shopping and coffee shops and restaurants. The cupboards are filled with the essentials like tea,coffee,salt&pepper etc...so all we needed to buy is the groceries we needed for our stay. The outdoor deck was awesome for morning coffee or evening wind down after sightseeing the city. Views are so tranquil. Thank you Susan for providing us a wonderful place to stay and we hope to be back soon. One suggestion is a BBQ for the outdoor deck would be awesome to cook some New Zealand lamb or the catch of the day! I'm pleased you managed to get some deck-time, it's a great spot for a coffee, wine and a good book. Sometimes I'm out on that top deck til 11pm in summer! You're not the first person to ask for a BBQ (kids have been going on about it for years, too). I'm going to pick one up in the winter sales and pop it just outside the kitchen by the herb 'garden'. It will be all ready and waiting for your next trip. Great house in a wonderful location. We stayed here for 40 days. Susi is an excellent communicator, getting back to us very quickly with any queries we had. The property was spacious, clean with lovely large bed and bed linen in main bedroom. The other bedrooms were great too! Lots of towels, shampoo etc provided. The views from the house were superb , and the house had two very spacious terraces to sit out on. The location was perfect, not just for a huge number of local shops/cafes/restaurants on Ponsonby Rd. but also for catching buses to the city centre and beyond. We had no complaints at all but must admit we did miss terrestrial TV ( just for the News etc! ). Also a BBQ would have been an excellent addition to have . We highly recommend this property and have already booked to return next year ! Morna, it was such a pleasure to have you and Bill to stay: I knew the house was in great hands, and I was so grateful to Bill for his MacGyver-esque home handyman skills when the storm damaged the garage door. The location is great, isn't it? Not hard to see why Ponsonby/St Mary's Bay are so popular. I hope you managed to get to Mary's, our all time favourite brunch spot. We are so happy you will be coming back next year, by then I might have gotten around to installing actual TV channels - we live our lives on the digital ones, but I know not everybody does. I've been thinking for a while that a BBQ would go very nicely on that middle deck, just outside the kitchen, so I'll put that on the wish-list, too. We lived here for six months during my husband's university sabbatical and could not have had a better experience. The house was perfect for our family of four - our school-aged girls had their own space downstairs, so we weren't on top of each other. The living area was comfortable, and the kitchen was well-enough equipped to cook regularly for a family. The Master was lovely and the office was spacious. But the terrace - ideal for coffee or wine - with views you'll love! I can't say enough great things about the house! The location is fantastic - heaps of restaurants on Jervois and Ponsonby - all within easy walking distance. Even walking to the CBD via Westhaven marina and the Viaduct was easy and beautiful. The area of town is beautiful, surrounded by bays and local beaches with friendly people and is very safe. Susi is so easy to work with and very responsive. She's reasonable, understanding, and knows a lot about the area. One review mentioned that there's not a bathroom on the main living floor and that's probably the only thing I'd change, but it's certainly not a big deal if you're good on stairs. You won't be sorry if you stay here - we'll always remember our time in Auckland SO fondly and our time at Susi's home has given our family memories to last a lifetime. We have just returned from 4 weeks in New Zealand, having attended all 3 Lions tests. We spent 11 nights over two different periods at Susi's house. We really got to love the place, and the wonderful internal design made us feel so at home. As two couples, it was great for each couple to have their own space, whilst being able to share the common lounge, dining and kitchen areas. Shelly Beach Road is a great base for central Auckland, which can be reached in about 15 minutes on foot, although obviously, buses and taxis are readily available in the area. We are missing our Auckland home already, and will return to beautiful New Zealand in the future, to appreciate even more your beautiful, beautiful country. Thanks so much Susi, and hopefully we will see you again in a couple of years. Hi Gary and co., I am so sorry I haven't responded earlier. I just saw this. We loved having you all, and we're so happy you enjoyed the house. I really appreciated your patience with the glitches we had - I'm just really pleased it all worked out in the end. Please come back soon...and sorry about the Rugby! Nestled in one of New Zealand's coolest and trendiest areas, the apartment sits between Herne Bay, Ponsonby and St Mary's Bay. From edgy/modern to bohemian chic cafes, this season's designer threads to pre-loved haute couture, fine dining to hole-in-the-wall casual, high end linen stores to ethnic homewares, there's something here for every taste and age. With some of Auckland's most popular restaurants, cafes and bars on your doorstep, stunning harbour walking tracks and gorgeous historic neighbourhoods to explore, you can be well fed, watered and entertained right here at home. However, venturing further afield has never been easier: a 10 minute cab ride or 20 minute walk is all it takes to get you main street shopping, Auckland's waterfront, the Ferry Terminal/airport bus, theatres, cinemas, the Casino and more. You're also just a street away from the Harbour Bridge onramp and minutes from the North Shore with its quaint architecture and world class beaches. We do not have a 'book now' button as we carefully screen all our potential guests. Please tell us a bit about yourself, other travellers and your plans in Auckland so we can kick off the conversation. We are very responsive by email and promise to get back to you quickly. Please note carefully the currency in which you are being quoted online, and then in the quote we subsequently send you - depending on which site or country you enquire from, you may receive an initial quote in USD and then a follow up from us for the same amount, but in NZ or AUD. This can cause confusion and wrongly give the impression we have changed the rate from that originally quoted.